Buy in quantities you know you will use. According to Lior, you can buy your spices whole or ground, depending on the frequency with which you use them. Whole spices will last longer than ground. Since a little spice can go a long way, make sure to buy quality products; they’re worth the investment. No need to put them in the fridge or the freezer -- the pantry is just fine. Use a coffee grinder to grind your spices. While Lior says a mortar and pestle can be “poetic,” a simple coffee grinder is easy to use, easy to maintain, and you don’t need biceps of steel. Be careful when toasting your spices. Never toast ground spices; they burn more easily than whole spices. Lior recommends toasting whole spices in an oven, keeping a close eye (and nose!) on them. 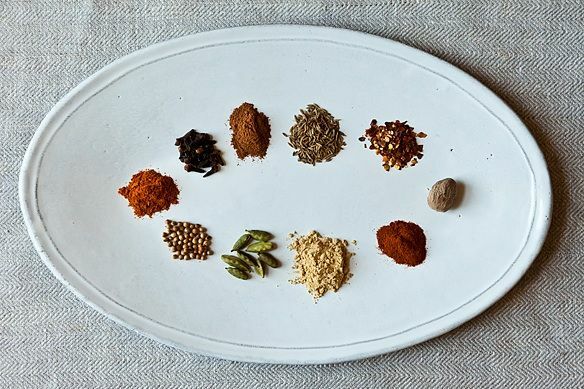 There’s nothing wrong with toasting spices to keep for later -- just make sure they’re stored correctly. Wouldn't it be hard not to burn spices in the oven? I usually toast cumin in a skillet so that I can toss it continuously. It takes less than 30 seconds. How do you do it so quickly in the oven without it burning? Some parts of my gas oven are hotter than others. And when I see that I'm going through a spice too slowly, I try to use it up more quickly on savory snacks like popcorn. Piment d'Esplette is a favorite for that.